The MT Haven was launched in 1973 after its sister ship sank earlier in the decade. 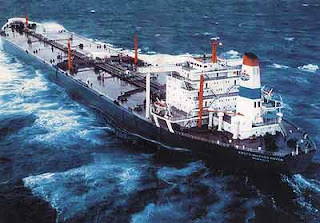 The main purpose of the ship was to carry crude oil from the Middle East gulf regions to various other countries. In 1987 during the Iran-Iraq war, the ship was hit by a missile and was sent to Singapore for repair. There, after it was fixed, the ship was sold to brokers. After being sold, the ship ran from Kharg Island (located off Iran) into the Mediterranean. For years the ship successfully ran its course back and forth through the waters. Until April 11, 1991. On this day, the ship was, as usual, unloading oil (about 230,000 tons) at a platform a few miles from Genoa, Italy. After unloading about 80,000 tons, everything went wrong during a routine internal operation and there was an explosion. A fire broke out immediately and flames were as high as 100 meters. More explosions occurred as millions of gallons of oil dispersed into the water. Six people were killed because of the disaster. Officials attempted to tow the ship to the land, but this failed as the keel was broken. A day after the explosion the ship sank, and for 12 years continued to leak oil. In the end the new owners of the ship were blamed due to repair of the ship after it was hit by a missile and put back into operation.